"We've built a relationship with Insight Hosting over the past several years. The pricing and the quality of the hosting are great, but it's the personal Customer Service that makes all the difference. I highly recommend them." 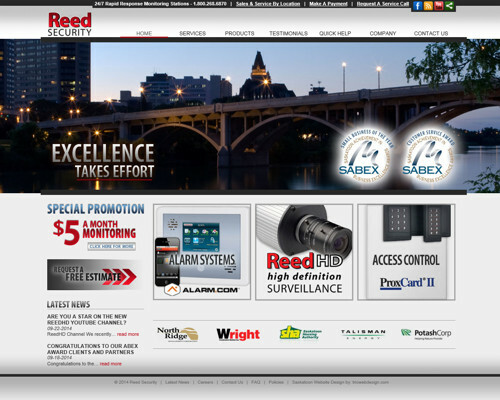 Reed Security is a security company with head offices located in Saskatoon, Saskatchewan. Reed Security offers excellent value to their clients, and they don't compromise on their service level either. Reed Security works hard in an effort to earn the business of their clients and build long term relationships. The Reed Security website features a secure online payment option, latest news blog and a vast array of information on their products and services. "I have been working with Tristan from Insight Hosting for over a year now, and I have always appreciated his hard work and caring towards both me and my business. I have been very happy with the service provided from Insight Hosting and the willingness to help us find new and more efficient ways to run Era's online world - we work closely with all of our suppliers via email so it is very important that everything is running smoothly at all times. I always appreciate Tristan's quick response time to questions I have and how easy I am able to contact him. As a busy business owner, the importance of making things happen instantaneously is critical and I know Tristan respects that." Era Style Loft is an upmarket women's boutique located in the heart of downtown Saskatoon, Saskatchewan in the historic Birk's Building on 21st Street. With its convenient location and modern design, the women of Saskatoon finally have a luxurious place to shop. Now, Era has expanded to offer that same in-store experience, online. Era offers everything from clothing and shoes, to handbags and accessories. Insight Hosting helped create a robust email solution for Era Style Loft to support the owners both in the store and during travel. The Era website features a completely customized shopping cart and e-commerce experience based on a high performance database system. "Dealing with Tristan and the team at Insight Hosting has taken a mediocre website from an independent business to a comparable corporate business model at a fraction of the price. Quick service when changes are required. Huge value to a smaller business trying to compete against the big boys." The visually stunning downtown Saskatoon development had humble roots. The Park Town hotel started as a local family business, and almost 60 years later, it remains a local family business. In 1990, Terry Verbeke took over as the General Manager of the hotel and in 1999 construction began on a further expansion to add 65 new rooms which were to include some of the best river views in the city. 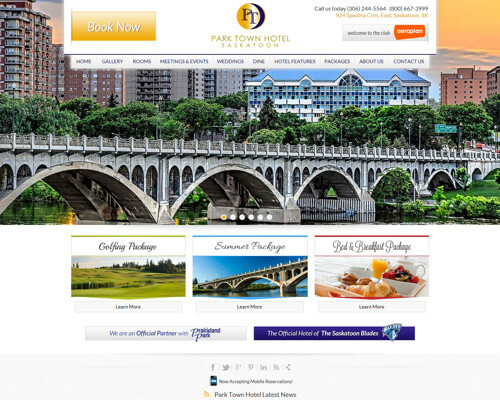 The Park Town Hotel website features a content management system and blog software, online tickets sales and room galleries. "Our decision to source Insight Hosting to administer our new web site was made with three primary requirements. We wanted a local company with demonstrated bench strength in graphic design, back end admin and technical support, and the experience to know how to leverage the site with ongoing partnerships in social media and search engine optimization. Insight Hosting has demonstrated outstanding ability in all three areas, and makes regular suggestions on how to improve our reach at reasonable or no cost. We are most appreciative of their work, and heartily recommend them!" Lakeview Square Dental Office is a general dentistry office located on McKercher Drive in the Lakeview Square Mall in Saskatoon. 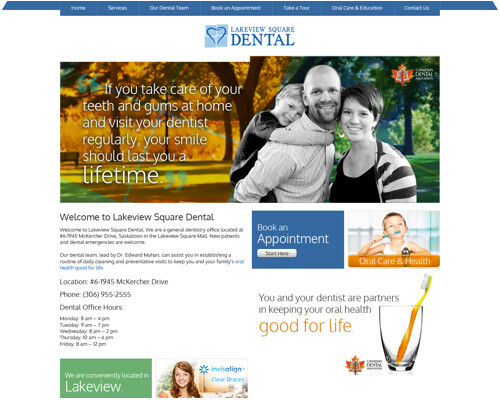 Lakeview Square Dental was looking for a modernized website and hosting strategy that would tie in their online booking and feedback systems. Cloud Services were used to provide a corporate email system that clinical staff can access even when they are on the go via a secure session running inside a web browser. "The services provided by Insight Hosting have given us a decided advantage with regards to our online presence. We have been able to leverage our social media and online advertising campaigns to drive traffice to our website and improve our search engine rankings. Our website has become a destination for our customers." Entering the 23,000 square-foot space at Palliser Rooms EQ3, a locally-owned and operated furniture store, is a delight to the senses. Despite its large size, the team at Palliser Rooms has created a space that is thematically focused, airy, visually stunning and surprisingly intimate and inviting. The smell of new furniture is always enticing and their use of accessories complements the floor models without overwhelming the eye. 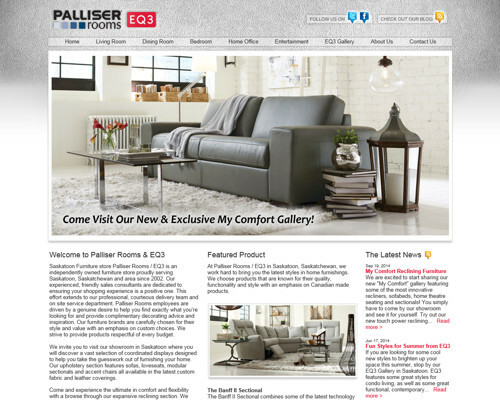 The Palliser Rooms / EQ3 website features large product galleries, online flyers and a latest news blog. "Managing a website properly is a very complex task. To provide frequent and timely updates which carry relevance in a professional way takes expertise beyond what we can do in house. Insight Hosting allows us to focus on what we do well, design and install anything relating to windows, walls & floors. They are the ones who ensure our website, which is an extension of our brand, is reflective of the quality that we provide our customers everyday." Braid Flooring & Window Fashions offers customers innovative and unique flooring and window covering options from around the world, in addition to carrying the most respected major brands in the industry. 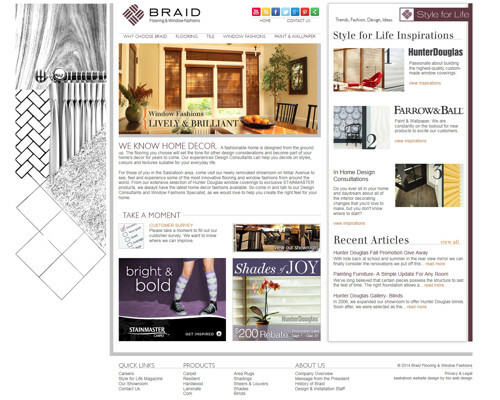 Braid Flooring & Window Fashions required business class hosting for their website which also houses their "Style for Life" online blog. "Insight Hosting has been a pleasure to work with. They were always very easy to reach when we had questions. If you're looking for a company that supplies first class service, I would look no further." Spanning more than four decades, Northern Strands has provided leadership and experience to diversified projects throughout North America, and always strives to uphold their reputation and long-standing track record as a company that offers high quality, economical and comprehensive solutions to the mining industry. 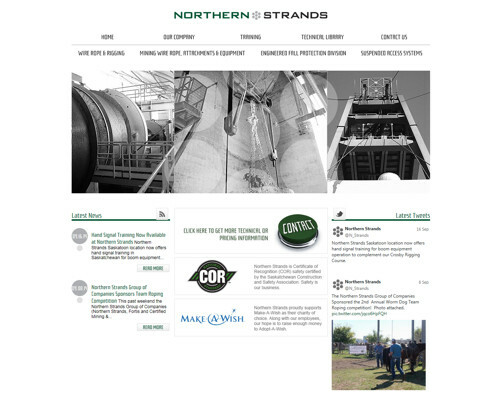 The Northern Strands website is a comprehensive tool for customers featuring the company's latest news and product offerings. "Our company is so thankful we found Tristan at Insight Hosting. Before we hired this company we had to continually check our domains for renewals as we have many and we are very busy - it was just another job that if missed was critical to our operations. Now we have the confidence this is being done on our behalf, and we are very happy with the results. If asked our company always highly recommends Insight Hosting." Al Hattie Insurance has been a family owned and operated insurance broker in Saskatoon for over 30 years, and is dedicated to providing all of their customers with a friendly, pleasant atmosphere in which to do business. 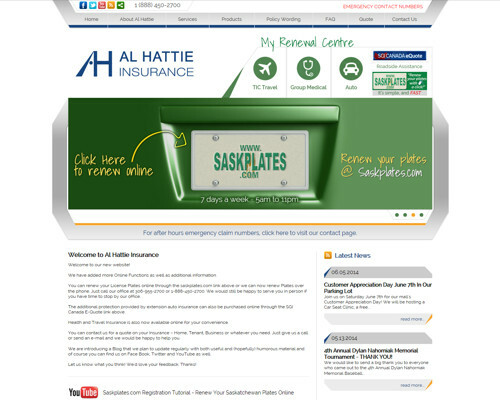 Al Hattie Insurance required robust website hosting for their main website, as well as specialized hosting for mobile optimized versions of their sites with additional functionality. "It has been a smooth and pleasant ride from start to finish with Insight Hosting. 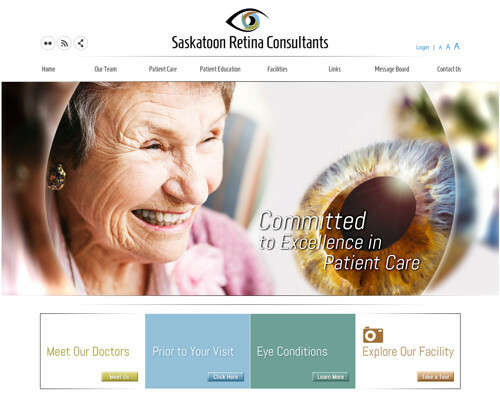 Their support and expertise has been invaluable for our new website at Saskatoon Retina Consultants. Thanks to Insight Hosting, our patients now have a new resource to learn about their eye condition and treatment options." Saskatoon Retina Consultants is a team of doctors consisting of Dr. Kevin Colleaux and Dr. Nigel Rawlings. Saskatoon Retina Consultants specialize in many different facets of Retinal surgery and treatments. The Saskatoon Retina Consultants website features a database system that allows optometrists to electronically forward referrals to the doctors for review. The website also features an updateable facility gallery, and also has the ability to allow patients to increase the font size of the entire site for those with visual impairments. "The Kinsmen Club of Saskatoon is a non-profit service organization. The club members are volunteers that devote their time to the club while maintaining both a family and work life. Insight Hosting has for several years provided our group the tools and assistance to allow us to focus on what matters to us... Serving 'The Community's Greatest Need'. The website they host for us provides an effective method of 'getting the word out' by integrating Facebook, Twitter, on-line event payments and an innovative internal communication system for our Members. Insight Hosting maintains and adds content as needed while providing invaluable services to both our club and the community that we serve." Over the years Kin Canada has had an impressive array of members, from Prime Minister John Diefenbaker to Governor General Ray Hnatyshyn and more. Members can probably name several people who have used what they have learned in Kin to become community leaders. The dream of Founder Hal Rogers started with an idea that spread to an organization with members from coast to coast. 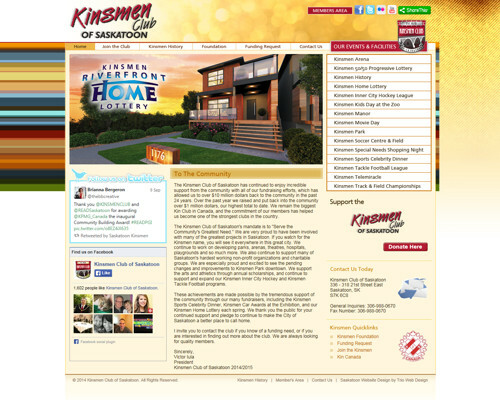 The Kinsmen Club of Saskatoon website features online ticket purchasing and donations, as well as information on all of the different events the club is involved with. Esprit Photography is a professional photography company in Saskatoon specializing in weddings, luxury portraiture and commercial photography. The goals for the website design were to create an exceptional tool to display the imagery while maximizing client engagement through the website. SEO was also a primary goal so that other areas of advertising could be reduced. 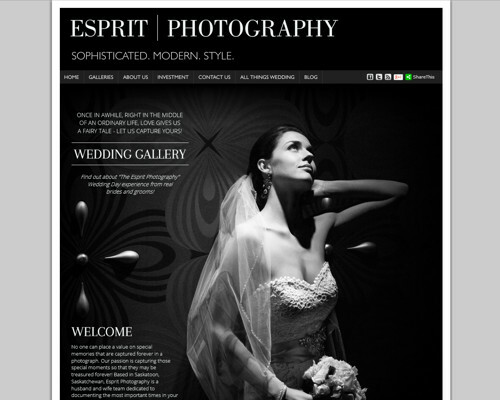 Esprit Photography utilizes cloud services and premium email hosting to manage email in the office and on the road. "Our website is very important to our company. We knew how important it was to pick the right website management company. Luckily we made the right choice with Insight Hosting. 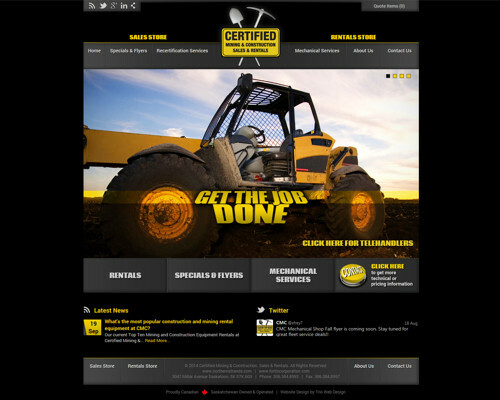 The website is running smoothly"
Certified Mining & Construction Sales & Rentals (CMC) is a Saskatoon based sales and rental company that offers specialized equipment to the mining and construction industries in North America. The CMC website allows buyers and renters to browse through a large selection of products for rental and purchase. An e-commerce engine with an HTML based management interfaced was overlayed on our high performance database management system to provide the required online solution. "Insight Hosting played a very big roll in the development of my new website and has been a tremendous help in showcasing my business. Along with my website, they set up all of my emails and have come down to my office to ensure that everything is working properly. Tristan is very quick to answer my questions and to trouble shoot any issues I might be having (as I am not very techie savvy). I would definitely recommend him and Insight Hosting to any one of my friends, family and colleagues." Deb Murdoch (TMG The Mortgage Group) has been a mortgage broker in Saskatoon for over 7 years. All of her years in the mortgage business have been with TMG – The Mortgage Group. 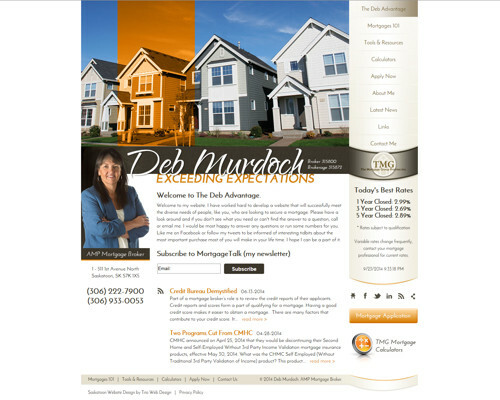 Deb has a passion for helping people get into new homes or refinance their existing home. Deb not only finds the lender and negotiates the best deal, but she also mitigates the process so that it is less stressful. Deb's website features online application forms, mortgage calculators, the latest mortgage rates and a blog with the latest mortgage news. "Insight Hosting has been a valuable resource for me providing exceptional assistance and support to help me set up and build my website, as well as ongoing management support of my site. Any time I have had questions or concerns, they have been met with professionalism, courtesy, and quick suggestions and resolutions. A great team, and a great addition to my team." Weber Group Financial is a team of professionals based in Saskatoon, SK who are dedicated to continuous growth both professionally and personally. Their advisors take a traditional and fundamental "hands on" approach with clients, providing a highly personalized service firmly rooted in the philosophy of building and maintaining long-term relationships. 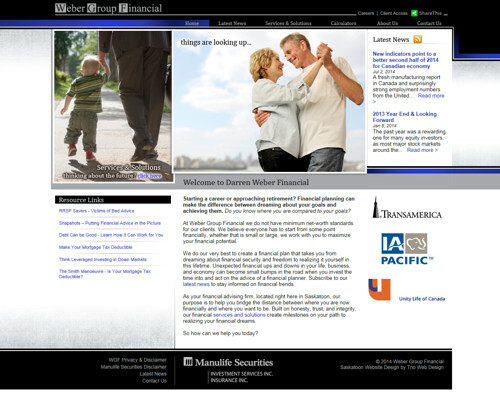 The Weber Group Financial website features a latest news blog, online calculators and product information. "I would just like to say how pleased we are with your services. Since your firm has launched our website, our online estimate requests have increased by more than double. We continually have clients referring to the information and photos that are included in the site. Our company name is now enjoying a strong competitive edge in our online marketplace. With the ongoing support and updates you are providing, we expect continued growth in this arena!" In 1981, Ram Manufacturing Ltd. opened its factory and first retail centre under the trade name The Energy Doctor® in Prince Albert, Saskatchewan, Canada. Ram Manufacturing's premiere product was an interior insulating acrylic window. The product performed very well in all climates reducing draft and condensation from windows. Ram started opening distributorships only 6 months after opening the first store. RAM is now represented throughout Canada and the United States. 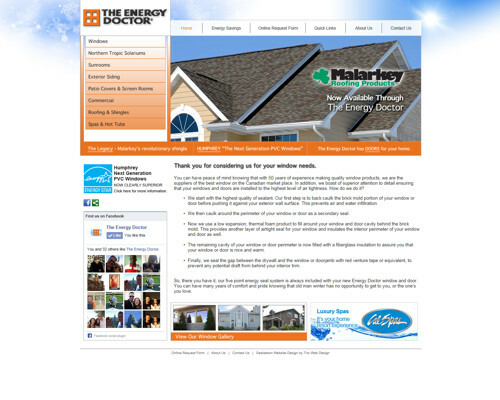 The Energy Doctor website features online galleries and product information. "Insight Hosting has been very influential in the success of Fitness Focus. Since our first major website launch in 2008, our website's user-friendly layout has helped our business grow and our greater presence on the internet and SEO has allowed our customers to find us much easier. We know we can rely on Insight Hosting for all our website needs." In 2002, Jason and Tammie fulfilled a dream of owning a Fitness and Health Centre. Being an owner operated business allowed Jason and Tammie to work hands on in the success of the business and ensured that a quality experience was delivered on an ongoing basis. The goal was to offer a fitness centre with a welcoming, fun, and safe environment that all ages could enjoy. Fitness Focus is a forerunner in the fitness industry. 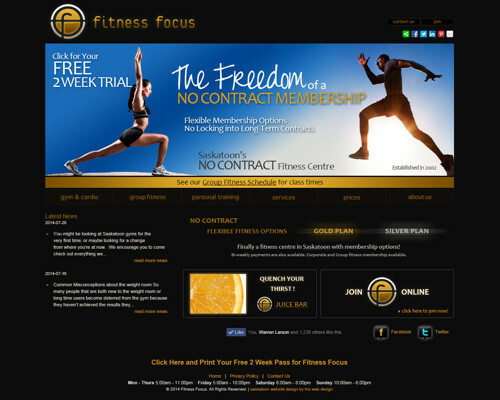 The Fitness Focus website features a database driven group schedule management system and blog. "Insight Hosting has kept me up and running 99.99% of my life on the Internet. And they are always there to help when I have needs ... and let me tell you, I'm needy. Tristan at Insight Hosting really knows his stuff, but I stick with him mostly because I like to work with friendly, professional people." Jason's quick wit and self-deprecating approach have endeared him to audiences the world over, from the Hollywood Improv to Carolines on Broadway to the Comic Strip in Edmonton. He has performed overseas for the troops and on the seas for cruise lines. Jason was a standout at the Cabo Comedy Festival and at the World Series of Comedy in Vegas. 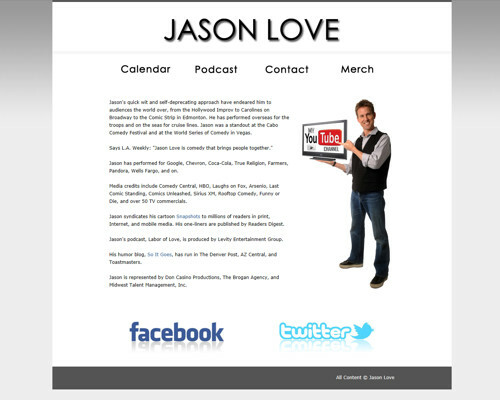 Jason's website features a database driven syndicated column feed to newspapers and websites around the world. "Insight Hosting has been providing the Saskatchewan Brain Injury Association top notch website management for the past 4 years. Website edits are made promptly and reliably and Tristan always works with us to create a user friendly and visually appealing website." Since 1985, the Saskatchewan Brain Injury Association has been helping individuals and families deal with the effects of traumatic or acquired brain injury. 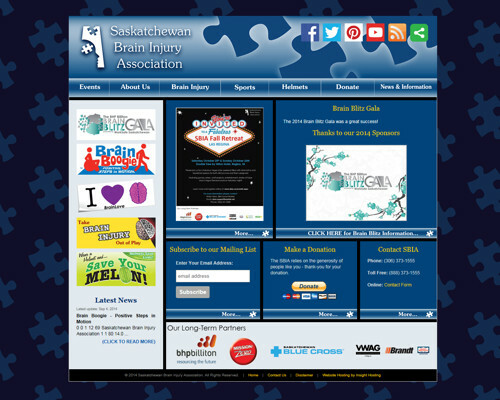 Founded by families whose children sustained brain injuries, the Saskatchewan Brain Injury Association (SBIA) is a registered charity, registered under the Saskatchewan Non-Profit Corporations Act, which provides support and service free of charge to individuals and families who are living with the effects of acquired brain injury. The SBIA website features event galleries, online event signup forms and a latest news blog. "Insight Hosting has hosted several of my websites for over 3 years now, and I have found them to be responsive, professional and great to work with. No matter the time of day Tristan is always available, and he is a true expert in his industry, I highly recommend Insight Hosting's services!" 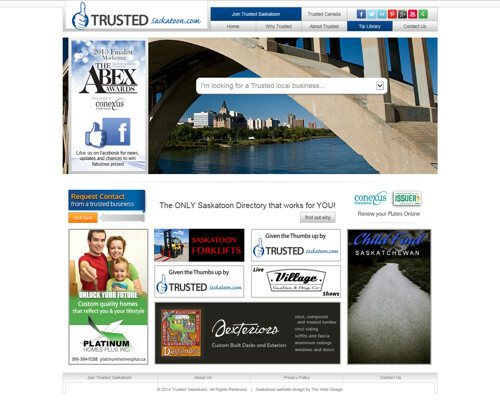 The mission of Trusted Saskatoon is to save you time, money and stress when choosing a local business. The Trusted Guarantees eliminate the unanswered questions or 'grey areas' when dealing with a Trusted Business. The Trusted website is built on our high performance database system and features an advanced administration interface for managing the Trusted website. The database results are displayed in an SEO optimized manner to help promote the local businesses in the directory. "I have been working with Insight Hosting since starting my scuba dive travel business in 2011. I had originally signed up with a major hosting service in the US but found that they could not provide the most current version of .NET that was required for my website design. I cancelled my service with them and have been with Insight Hosting since the git-go and they have never let me down. Any user questions I have had have been answered fast and explained so a tech dummy can understand. I highly recommend Insight Hosting for any business looking for a provider with reliable service and fast support." Most, if not all, dive travel businesses are owned and operated by people who are scuba divers and have a passion to experience new places and the wonders of the ocean. Unlike many other business owners, it seems ocean water may run in our veins. The mantra of Liquid Diving Adventures is "eat, sleep, dive." 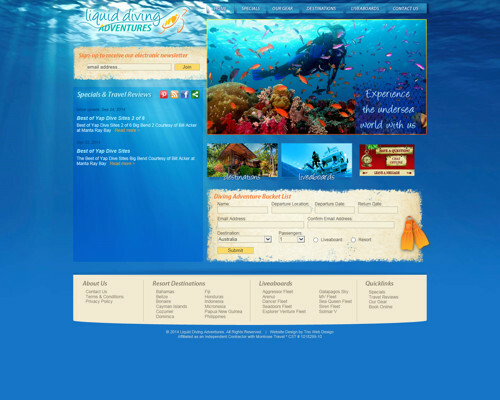 The Liquid Diving Adventures website features a latest news blog, booking forms and destination galleries. "We have been with Insight Hosting for the last 13 years and our web-site is vital to our ministry. Insight Hosting has given us a website which is second to none, and has provided quick helpful support. I would highly recommend their services to anyone desiring a quality, cutting edge web-site." 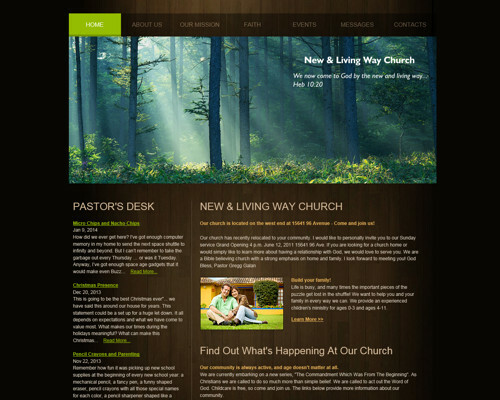 New & Living Way is a local church located in Edmonton, Alberta under the direction of Pastor Gregg & Pamela Galan. The New & Living Way website features an embedded Youtube channel with the latest digital messages from the church services. A blog and latest events section with a browser based administration tool allow people to connect with the church online. "Insight Hosting provides our nonprofit organization a home for our website, as an in-kind gift. Our website is our most important tool and ensures that young women in need across the province can find out about and access our services, so we are extremely grateful for the opportunity and to work with the wonderful team at Insight Hosting." The Princess Shop creates an enhanced graduation experience for female students in need, and provides them with mentorship, support, and the tools to pursue success after graduation. The vision of The Princess Shop is that each young woman in Saskatchewan would have the opportunity to celebrate her accomplishments and reach her full potential, ultimately positively impacting her entire community. The Princess Shop website features a content management system and latest news blog, events pages and donation forms. "It has been my pleasure to work with Insight Hosting. Tristan has provided me with website design and hosting for many years now. In the course of our relationship, Tristan has always been very professional and organized. Tristan has strong interpersonal and communication skills, which allows him to understand my company's needs. I continue to be amazed even long after my website has been up and running with the professional attitude and performance from Tristan and his staff." Changes Hair Salon & Spa is one of Saskatoon's finest, largest and most well-established health and beauty facilities. Changes allows you to escape from your usual routine for a remarkable spa experience! At Changes, you will find a 5,000 square foot luxurious salon - comfortable, relaxing and inviting. The Changes Hair Salon & Spa website features integrated social media and an online Spa menu. "I have been dealing with Insight Hosting since launching my business nearly two years ago. They are prompt, efficient, proactive and very thorough in their work. In addition to the nuts and bolts of hosting, they have offered great suggestions in where content is best placed. It has been a pleasure to deal with Insight Hosting and I highly recommend them"
For employers, hiring is a costly process whether done internally or with the assistance of a recruitment company. If the successful candidates or their families don't feel comfortable in their new city, both the initial investment is lost and the costs of the whole process begin again. For employers the ideal situation is when the new employee arrives ready to work, knowing their families are taken care of and not distracted by the details involved in the resettlement process. 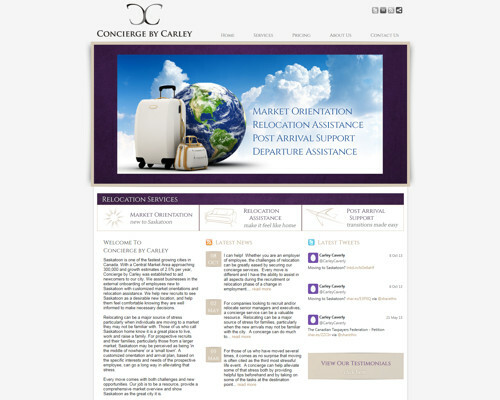 Concierge by Carley provides the essential services to help employees with the relocation process, the website features services and forms to help clients with their requirements. "Insight Hosting has been a reliable and professional organization that has met all my creative and business needs. I've been happy to refer others to Insight Hosting and look forward to growing with them in the future"
With multiple performing arts instructors, the Studio XII Music & Dance Co. hires certified instructors who are not only specialists in their fields, but also have a passion for sharing their knowledge with others. From the infant stage they look to develop programs that will assist young families in educating themselves and their children right into adulthood! 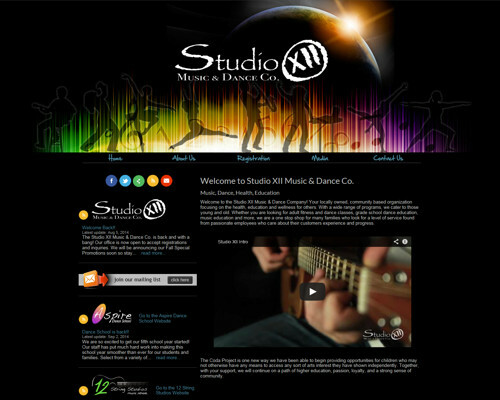 The Studio XII website features a content management system and latest news blog feed for clients.